Featuring Shu Qi (舒淇), Chen Kun (陳坤), Huang Bo (黃渤), Angelababy and Xia Yu (夏雨), fantasy blockbuster film Mojin: The Lost Legend <鬼吹燈之尋龍訣> has been performing phenomenally at the Mainland Chinese box office. 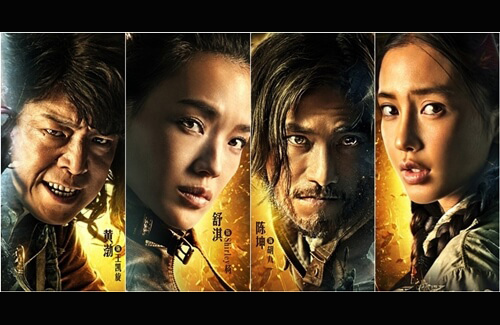 Set in a fantasy world, the film tells the story of Hu Bayi (Chen Kun), a renowned tomb explorer who retires in the United States with his fiancee, Shirley Yang (Shu Qi). Bayi however makes the unexpected discovery that his first love, Ding Sitian (Angelababy), who was presumed dead 20 years ago, may still be alive. Bayi decides to enter an ancient and mysterious tomb in search of his first love, thus encountering all sorts of strange characters who bring him on an unforgettable and perilous journey. Since its premiere on December 18, Mojin: The Lost Legend has racked up an impressive $193 million USD in box office sales and counts itself among the top five most highly grossing films of all time in China. 2015 has generally been a highly positive year in terms of box office performance for Chinese cinema; the total box office sales for 2015 stands at $5.76 billion USD, increasing by 48.7% compared to 2014. Approximately 61.6% of the box office sales can be attributed to Chinese-made films, highlighting Chinese films’ continued dominance in the market. To commemorate the film’s fantastic box office performance, Angelababy, Xia Yu, Chen Kun and Huang Bo have all respectively produced limited edition gold medals featuring the likeness of their characters in the film. Shu Qi recently declared that she too would be releasing limited edition gold medals featuring the likeness of her character. The news was warmly received by fans, who have been collecting the limited edition gold medals with great fervor.